Bryan Wood's CD named "Broken" is available on iTunes, eMusic, Rhapsody, Napster and more. Produced, and mastered at Recording EDGe/RecEDGe Records. My music helps people understand that when asked, God brings hope and peace, helping us rise above our problems. Discovering at a young age that music was his passion, Bryan Wood spent two years playing guitar and performing lead vocals with several local bands. In August 2005, Bryan released his first CD 'A Reason To Carry On' with his former band The Excluded. This was a great milestone for Bryan at 16 years old. This CD was a mix of acoustic and electric sounds and was enjoyed by young and old alike. Bryan is now performing his solo hard-edge acoustic Christian music with plans to branch out in the Northwest. His new solo CD 'Broken' was released in July of 2006. In a remarkably short time, Bryan has written over 40 songs. Songwriting, singing, and playing guitar is his way of communicating encouragement and hope to the world. He wants his music to show people that God can bring hope and peace to us and help us rise above the sadness and pain we sometimes experience. Above the pain and problems of this world, God can bring us to a place of peace and strength and give us hope to carry on. No matter where you are at in life, God is there ready to meet up with you. Inspired by Romans 15:13: May the God of hope fill you all with joy and peace as you trust in Him so that you may overflow with hope by the power of the Holy Spirit. <?xml:namespace prefix = o ns = "urn:schemas-microsoft-com:office:office" />Bryan Wood Broken is the most unique hard-edged acoustic rock music on the market. Jesus Christ, for everything you�ve done and all you�ve given me. Mom and Dad, for all your time and support. You�re the best! Tyler and Erik for being awesome brothers. Edd Gryder, for making this project way more than I imagined! I look forward to many more years of work together. Thank you JAD for all the work and effort you have put forth! Justin Johnson, for brutally beating these songs into oblivion and for helping to coordinate an amazing team of top notch musicians; Mark Hill, Justin Glasco, Matt Pierson, Scott Sheriff. There are so many people in my life that make a difference! Thank you my family and friends for your continuous support and encouragement. And thank YOU, who are reading this for listening to my music. I love you all! 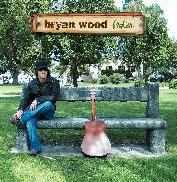 For Bryan Wood�s current tour information and other exciting updates see... http://www.myspace.com/bryanwoodmusic.